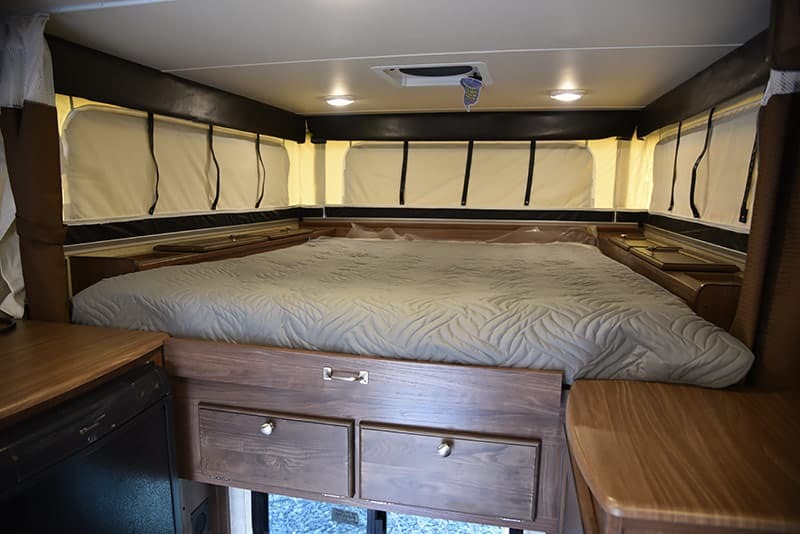 The north-south cabover bedroom in the Palomino SS-550 is all about comfort, storage, and simplicity. The north-south bed means you don’t have to climb over your spouse to get out of bed. It’s bad enough that she puts up with your snoring, grumpy behavior, and belief that not showering for three days doesn’t make you stink. With the north-south bed, you can at least let her sleep. 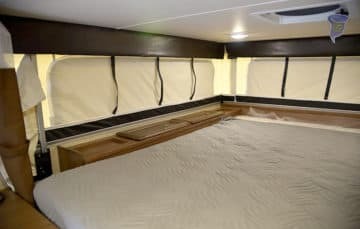 On either side of the 60 by 80-inch queen-size bed are large two-door hampers; excellent for day-to-day clothing storage. 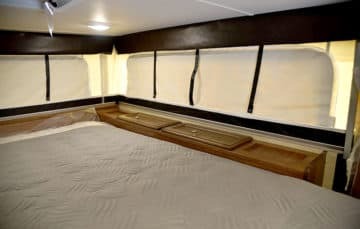 In our camper, storage equality – having the same amount of storage opportunities on both sides of the bed – is very important. By putting exactly the same large hampers on both sides of the bed, Palomino has avoided this potential marital disharmony. Looking closer, I would prefer the hamper openings and doors to be significantly larger, especially since the available storage area is exceptionally deep and wide. Speaking from experience, it’s good to open a cabover hamper and quickly see that you have ample socks, underpants, and T-shirts ready to go. With the SS-550 set-up, some of these items could hide under the cabinet face. 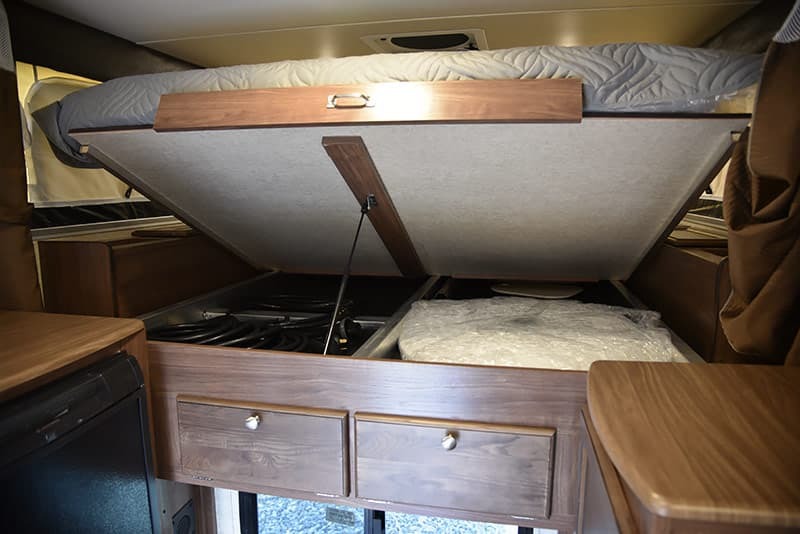 The under bed storage is begging for more clothing items, camping gear, and even food items. Unless you might need it when someone is in the bed, why not store it in this location? 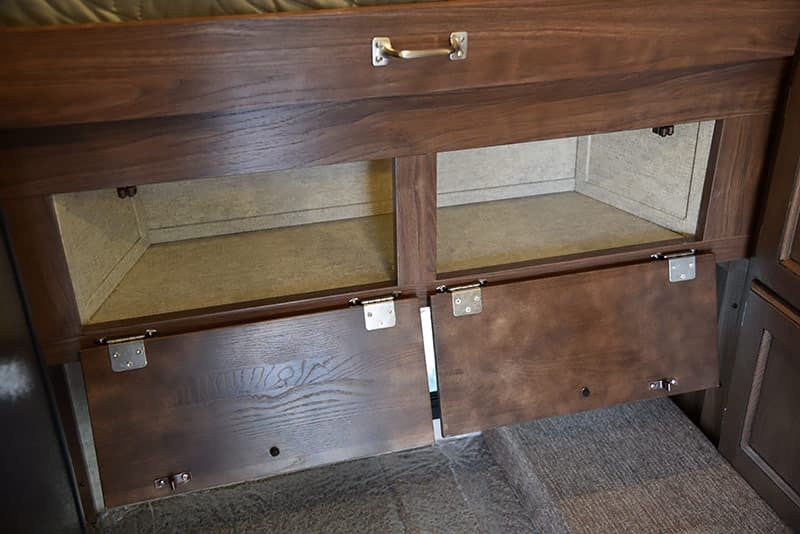 The single gas strut makes lifting and lowering the bed a cinch. Love it! 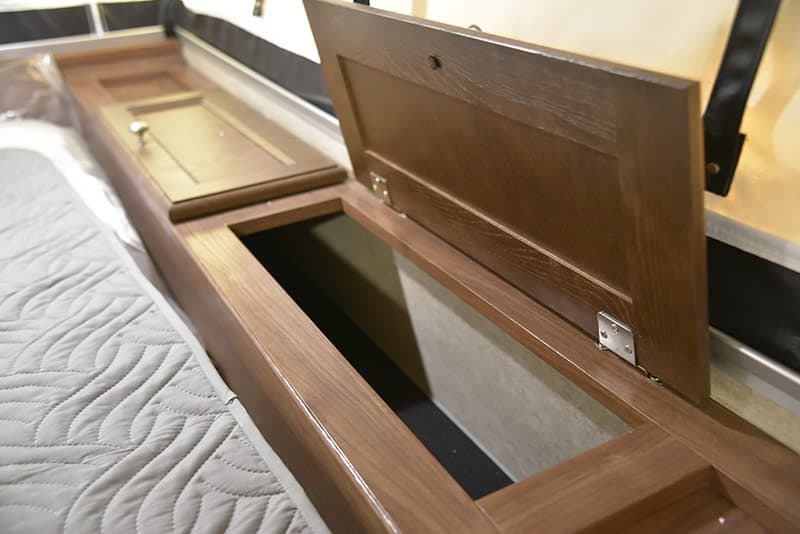 Immediately under the lift handle for the bed is a two door drop-down storage nook. The central location of the cabinets makes them extremely versatile. In fact, I couldn’t help but be impressed and impressed again with the quantity and quality of the storage in the SS-550.